High Rock, the westernmost province on the mainland of Tamriel, is a land of temperate climates and soft rolling hills, split in half by the towering Wrothgarian Mountains. The quaint charm of its hamlets and austere grandeur of its cities speak of a gentle life, something that was only a distant dream for most of the long, peculiar history of the Bretons. With its fertile soils and generally clement weather, it is little wonder that the region that is now known as High Rock has attracted many cultures throughout its history. The Gods were the first of these. The Adamantine Tower, in a little island in the middle of the Iliac Bay, is widely considered to be the oldest structure in Tamriel. If the ancient tales are to be believed, it was crafted in the Dawn Era by the Gods themselves to have a place for meeting and deciding what would be the fate of Nirn. Perhaps this is merely a myth, but it is true that when the earliest Aldmer came to the region, the Tower was already standing. There is evidence that early beast men of one variety or another may have been the original inhabitants of High Rock, but the Aldmer coming from Summerset Isle were the first to settle and form permanent communities. The early Nedic people who arrived next were stumbling upon a highly sophisticated culture, and were quickly overwhelmed and absorbed. One of the earliest tales of Khosey describes a Nord raiding party attacking a group of what they presumed to be Aldmer, but who were, on closer inspection, a mongrel race between elf and human, the remnants of the earlier lost Nedic tribe. 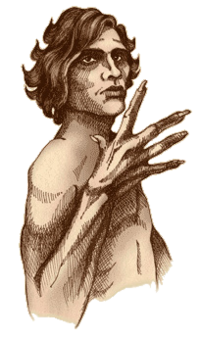 They were somewhat awkwardly called "Manmeri," but we know them today as Bretons. It took many centuries for the Bretons to become the dominant force in High Rock. For most of the First Era, the elves kept their hold on the land, with the Nords founding fortified towns along the coasts to support their pillaging parties, such as Daggerfall, which as a kingdom would have a profound influence on High Rock in years to come. 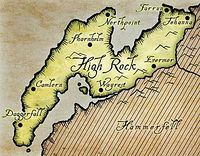 Of all the families of Aldmer who colonized High Rock, none did it so successfully as the Clan Direnni. So dominant were they that by the middle of the First Era, the whole of High Rock was commonly called "The Direnni Hegemony." As an economic and military power, they were formidable enough to pose a continued threat to the battle-hardened Nords and the nascent Alessian Empire of Cyrodiil. Taking advantage of the internal strife in Skyrim, the Hegemony began taking land north and south of High Rock, claiming portions of Skyrim and present day Hammerfell. At the peak of their power, they controlled nearly a quarter of Tamriel. But they had overextended their reach, and slowly, year by year, they lost all that they had gained, falling back to their fortress in Balfiera, the Adamantine Tower, now called the Direnni Tower. The Bretons were operating beneath the eyes of history, and their rise in High Rock was through commerce and the foundation of small villages in well-chosen positions, such as the sleepy fishing hamlet of Wayrest on the coast between the Bjoulsae River and the Iliac Bay. Daggerfall, Camlorn, Reich Gradkeep, and many other Nordic cities became Breton not by any act of war, but simply by being assimilated by them. By the end of the First Era, High Rock was the land of the Bretons, and would be so ever after. But High Rock was never a single cohesive Breton nation. The power vacuum left by the decline of the Dirennis fractured High Rock into a hundred fiefdoms of small, walled city-states. This has often left the Bretons at the mercy of the larger powers of Tamriel, but has also made High Rock surprisingly resilient during the times of chaos following the fall of the great empires. Scarcely had the rule of the Dirennis passed into history before two new powers arrived in the region. The Redguards of Yokuda began their conquest of Hammerfell in the 808th year of the First Era, largely displacing beast folk in their attacks, but also supplanting Breton settlements along the southern Iliac Bay. The two cultures warred over dominance in the Bay, until they were faced with a common enemy in the Orcish kingdom of Orsinium. The rise and fall and rebirth of Orsinium is detailed in a later section, but suffice it to say for now that the discovery of the "monstrous" kingdom of the creatures, as they were regarded, was a very unpleasant surprise to both the Redguards and Bretons. An alliance between Daggerfall and the new kingdom of Sentinel led to the long war known as the Siege of Orsinium. The humans eventually prevailed: Orsinium was destroyed and the Orcs dispersed far and wide across Tamriel. High Rock fared relatively well during the long interregnum following the fall of the Cyrodilic Empire, but its multitude of fractious kingdoms were easily conquered by Tiber Septim. Indeed, many Bretons welcomed the rebirth of the Empire. Still, some of them managed to unite to stop the encroachment of the Camoran Usurper in his destructive march northward from Valenwood in 3E 267. With a weak Emperor on the Imperial throne, and no clear leadership from the usual powers of the west, the Usurper may have swept over High Rock had the smallest of regions of the Iliac Bay not banded together under the Baron of Dwynnen to defeat him. Once again, an overwhelming force had underestimated the Bretons, and been defeated. The unity was lost when the threat was removed, and for the next one hundred and fifty years, internal and external conflicts continued. In the east, the Nords reclaimed some of their old kingdoms in the War of the Bend'r-Mahk. In the west, the War of Betony, though ostensibly between Daggerfall and Sentinel, spilled into Daggerfall's neighboring kingdoms. In the center, Orsinium reappeared as the home of the Orcs, threatening once again the fortunes of Wayrest. In the year 417, however, the province redefined itself in a most mysterious way. They call the event the Miracle of Peace. On the 10th of Frostfall, a strange force exploded over the Iliac Bay, displacing armies and decimating whole territories. Though its nature is still unknown, most Bretons believe it was the ancient Gods who had once made High Rock their home scouring the land, making it whole once again. Though it was a painful process for most - the Miracle is sometimes spoken of as the Warp in the West - the result of it is a province that is more unified than it has ever been in modern history. Where once there were a hundred small squabbling kingdoms, today, just two decades after the Miracle, there are five. Battle-weary, the kingdoms of High Rock have eschewed violence recently in favor of diplomatic solutions. This is not to say that there have been no tensions over the new borders between Daggerfall and Wayrest, or between Camlorn and Northpoint and Evermore, but they are localized skirmishes, and have yet to explode into war, as they might have done in the past. The royal family of Daggerfall has recently celebrated the marriage of their son Camaron to Lady Kelmena, the daughter of Duke Senhyn of Camlorn, suggesting a possible unified kingdom along the western coast of Tamriel. King Gothryd and Queen Aubk-i's own marriage twenty years before had cemented relations and formed the basis of the peace between Daggerfall and Sentinel, which continues to this day. Northpoint and Evermore were not directly affected by the Miracle of Peace, but took advantage of it, swallowing up their small neighbors in the chaos of its aftermath. Far enough west to avoid the predations of Skyrim in the Bend'r-Mahk, and far enough north not to be targeted by Daggerfall and Wayrest, they have been quiet of late, watching their neighbors distrustfully. The Queen of Wayrest, Elysana, is considered by many to be the most feared ruler in the West. It is hardly surprising, considering that in order to achieve the throne, she had to outmaneuver and defeat her stepbrother, Helseth, a man now renowned in the East for his cunning, as well as his mother, Barenziah. With her consort, Elysana continues to control and dominate politics in High Rock, and her recent alliance with Wayrest's old enemies, the Orcs of Orsinium, has many observers wondering what her next move will be.